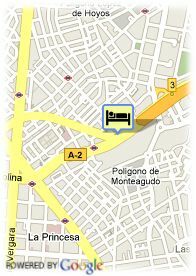 Avenida America, 41, 28002 Madrid, Spanje. 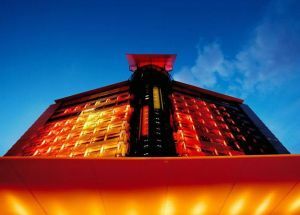 The Hotel Silken Puerta América is an exclusive area in which to experience the pleasure of innovation. Different art forms and ways of understanding design congregate in this spectacular hotel. Allow yourself to be captivated by the attractive 12th floor by Jean Nouvel, the stylish but cozy fifth floor by Victorio i Lucchino, or the elegant high-tech atmosphere created by Norman Foster on the second floor. The Avant-garde lobby bar created by the world-famous architect, Marc Newson, offers a very American concep, a select exercise in design signed and sealed by 19 designers of international prestige, architecture in capital letters, Fabulous flavors and exquisite aromas in an incomparable setting. Betalende overdekte parking aan het hotel (23.54 €).